Hi, I am new to Cinderella collecting and I am trying to find out about Metzeler labels. I have 6 labels all different showing airships and early aircraft, any ideas as where I can find information. Oh yes, welcome to Cinderella Collecting ! Now that was quick, thanks for your speedy reply. The attached labels are the ones I would like information on. Would they per chance be a set? I cannot tell you anything about the labels themselves as I have only seen the odd one before but research will tell a lot. 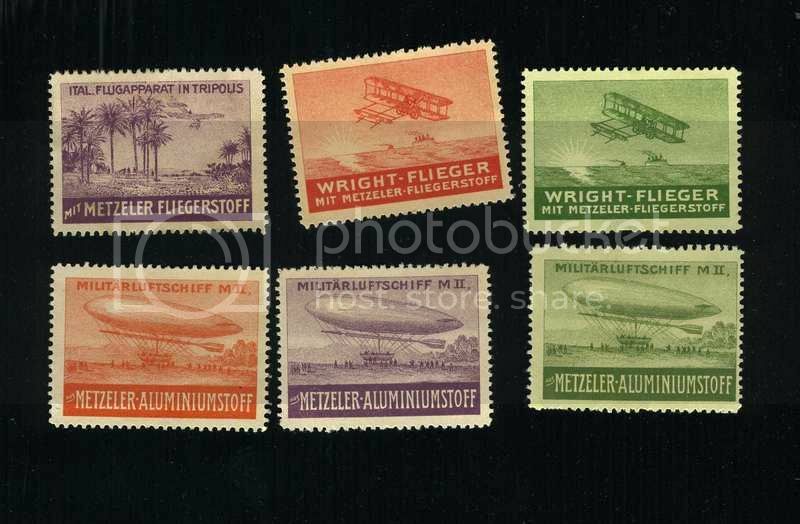 The Wright Flyer type exists in many colours and shades and make a very attractive set. They depict the plane flying over the Atlantic in 1903 and I believe it comes from a German painting. There are colours and shades for the other two designs shown as well and many other designs. They make for attractive pages. Google the key words and you should come up with a ton of information. Thanks for showing these nice Cinderellas. Hi London Bus, It's a long time since I saw your name, I used to use Stampboards alot as lofty. Yes, I remember Lofty ! Hope all is well with you. There is a lot of literature out there about Cinderella collecting but not much in the way of catalogues like Gibbons and Scott are to stamps. You can make a search on the net to see what there is but many/most are not easy to find. There are Catalogues for GB Commemorative labels [Chatfield]; British philatelic Exhibitions [Morgan/Wilson]; Delandre Poster Stamps; Christmas Seals; just to name a few. Many too in other languages covering items such as those you showed here but I have not seen enough of them to be specific. It's great fun searching though. Are you still on Stampboards ? I still have my name on Stampboards, but I don't use it because a couple of times I used the wrong heading and got a nasty comment from Glen, If he had said it to my face I would have lumped him. So I stay away from Stampboards and use other sites mostly German. I think in my case it's called " Cutting your nose off, to spite your face "
Thanks for the tips on Catalogues, happy collecting. I jumped the Stampboards ship too. Welcome french47, are you one of Colin's Norfolk crowd? I don't know French 47 but am very happy to welcome him aboard! And I have only lived here for 30 years or so and am therefore not considered 'proper' Norfolk yet!